I have some backlogged posts to get through. During my awful hospital-filled week, I did not paint my nails. I just picked that up again yesterday.. but I believe I have 4 posts to do before we get to the current activity. Should be caught up by the end of next week.. aka.. my birthday! Awe yeah! I always get so off track. Many weeks back, as I normally do, I sent a text to my sister asking her what I should paint on my nails. Her response this particular time was for me to do rainbow skulls. 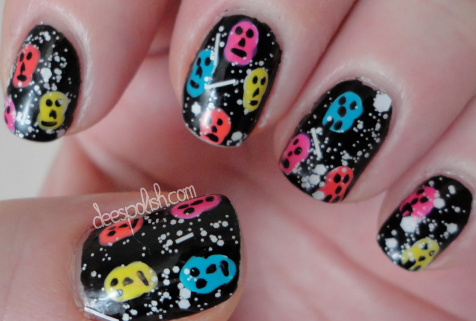 The idea = rad, but I have not painted skulls on my own nails in a long time. A nightmare ensued. Then, when all was done, at first - hated them.. but then.. ehhh they weren't too bad and it was 1 am, and work in the morning, etc etc. I left them. One of the gals at work said they looked like unhappy faces.. and I liked that so much more! My subpar skull nails turned into awesome unhappy face nails. Life miraculously went on. That is all for today! See you again reeeeal soon! !